What will the religious makeup of the Israeli population look like in the coming decades? According to the projections of the Central Bureau of Statistics (CBS), the Haredi population will compose about 50% of the Jewish population in Israel by 2059. However, this assessment does not take into account religious mobility between the different sectors. In this study, researchers Prof. Alex Weinreb and Nachum Blass examine trends in religious mobility among Israeli Jews, as reflected by the movement of students between sectors in the education system, and find that the bulk of the movement is towards less religious streams. The study finds that the State education system is larger than would be expected on the basis of fertility rates in each sector, while the State-religious and Haredi education systems are smaller than would be expected. As expected, the number of students enrolled in the Haredi education stream increased at the fastest rate between 2001 and 2015: from about 16,700 1st graders to about 28,000. In the State-religious stream the increase was from about 15,000 to about 21,500 students, and in the State education stream from about 45,000 to about 62,500. From 2013-2015, the number of students in the Haredi education stream was about 7.5% lower than expected given fertility rates in the Haredi sector. From 2001 to 2015, the State education system increased at an annual growth rate of over 2% –higher than expected given fertility rates among the secular and traditional populations. During the same period, the increase in the number of students in the State-religious education system was consistent with fertility trends. The study records which religious education stream students belonged to at the beginning of the research period (1st grade) and at the end (8th grade). Almost 98% of the students who attended State schools in 1st grade remained in this stream in 8th grade. The share of those leaving the State-religious education stream was about 20% of girls and 25% of boys. Most of these students transferred to the State education system, and only a few completed the research period in Haredi schools. About 11% of girls and 13% of boys left the Haredi education system. 6.5% transferred to the State-religious system and about 4.5% transferred to the State system. Across the 2001-2015 period, there was a net flow of 9.0% of boys and 6.4% of girls from Haredi to one of the less religious streams by 8th grade (about 60% to religious schools, the rest to State schools). Likewise, there was a net flow of 16.4% of boys and 11.7% of girls away from State-religious schools toward the State education stream. The net flow of students from more to less religious education frameworks seems to indicate the direction of religious mobility in Israeli society: a slowdown in the growth of the Haredi and religious populations and a slight increase in the growth rate of the secular population. The Haredi population will certainly continue to grow, but at a slower pace than expected. If these trends continue, they will have a significant impact on the future composition of Israeli society. 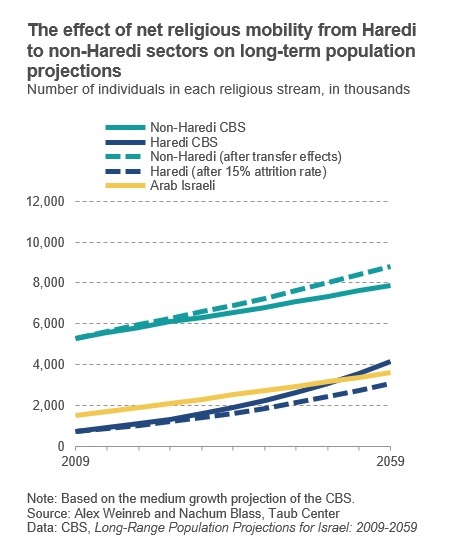 Though the CBS projections predict that for every 100 non-Haredi Jews in 2059 there will be about 50 Haredim, if trends in religious mobility are taken into account, there will be closer to 35 Haredim for every 100 non-Haredi Jews.